After going on about not having culottes and not knowing how to wear them, this is my fourth post featuring a culotte of some sort, so clearly they have gone up in my estimation. They really have become a massive favourite of mine, and I have spent the day shopping eyeing up two new pairs from Topshop and Primark, whilst already in a culotte-d outfit. I have always been a fan of a monochrome, minimal look and I feel like this is just that. Very basic and easy, that effortless but chic look. Culottes to me feel like black trousers - no matter how you wear them even if it is super casual, they still add an element of a smart and together look. Even though these ones in particular are actually that jogging bottom material, I feel like they appear fancy enough to wear outside the house. The black crop I have had for a while and it is always a go to item for me, especially for nights out. The visible bra straps really don't bother me but I know some people really hate them (get over it mum!) I actually quite like the double strap look but maybe if I could ever find a decent strapless bra I would like it without also! 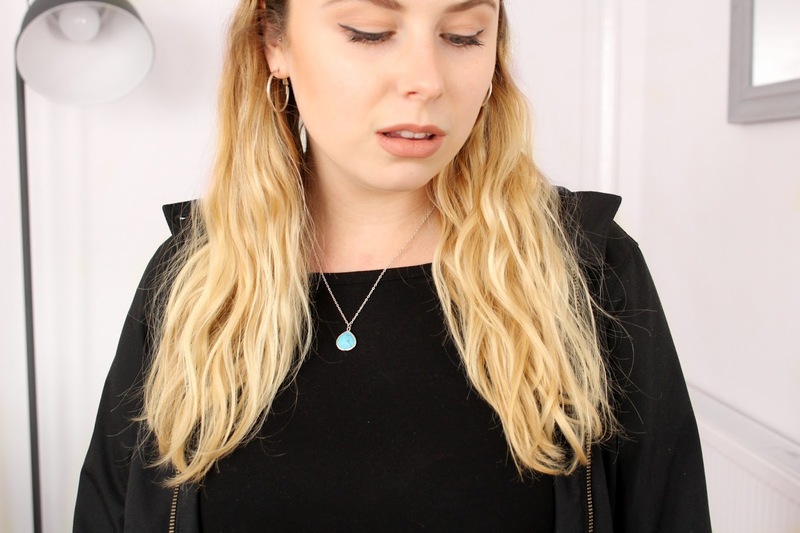 I love wearing this top because it is high neck with a little gem style necklace, the neckline really makes any necklace really stand out, not to mention the blue on black. Love love love. Sticking with this casual vibe I went for my Fred Perry Harrington jacket, instead of something a little smarter. My lovely boyfriend bought this for me a couple of Christmas' ago and I love it soo much. It is just so comfy and casual and I love the little pop of red you get every now and then. I did put this with my leather jacket at first but I think this just worked so much better. Snakeskin has become another little obsession of mine of late and this bag is a result of this. I think I have pretty much used it most days since buying it. Because it is grey I can pair it with majority of my outfits and because it is small it means I have to regularly go through my bag and clear out all the rubbish that end up in there that I really don't need to carry round on a day to day basis. Anyone else have any obsessions like snakeskin and culottes that I clearly seem to have going on? What are they? For instant and daily updates you should!